a type of resistance-training exercise using barbells, dumbbells, or machines to increase muscle strength. See also strength training. A health-promoting exercise which is useful in any age group, especially the elderly. Weight training increases muscle mass, walking speed, climbing ability and sense of well-being; it is believed to be beneficial in arthritis, cardiovascular disease, depression, type-2 diabetes, obesity, osteoporosis and in increasing gastrointestinal transit time. Water balance. 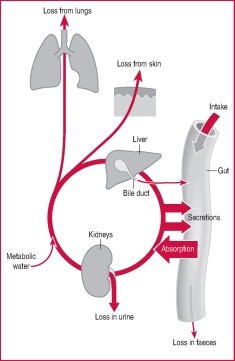 Size of the arrows represents relative volumes of water moving in and out of the body, and exchanged internally with the gut, over a typical 24-hour period, with moderate activity in temperate conditions. The circle represents the circulating blood and other extracellular fluids. strength ('resistance') training using either free weights or those providing the loads in exercise machines. See also strength training. It has been accused of turning ordinary people into muscle-bound freaks and many people feel that weight training is more likely to make them look bigger rather than slimmer. Weight training, as generally recommended, calls for working out against moderate resistance in order to tone muscles and build muscle endurance. Our results suggest that long-term weight training could be considered by patients and doctors as an important component in managing Parkinson's disease," Corcos added. The weight training protocol consisted of four lower-body exercises. The American Heart Association reported in the February 2000 edition of Circulation: Journal of the American Heart Association that weight training is a good way to improve heart health (Reuters Health). A complementary program of weight training, however, can provide such important additional benefits that the AHA urges healthy adults and many low-risk cardiac patients to do a single set of one to ten different resistance exercises two or three days a week. Aiming for a more toned physique, more are realising that weight training has a role to play in their overall workout. WEIGHT gain; Women may have overcome their preconceptions about going to the gym, but weights are still avoided by even the most fitness conscious. Mel Hunter asks are women missing out on a great workout option? Of 31 published studies on the subject, 27 showed that children gain strength from weight training or isometrics programs, with relative gains that are similar to those obtained by adults engaged in such programs. But after the weight training, these ladies were probably at least 10 years, if not more, further away from that day than they were before. For many black women, good health translates into aerobic classes, weight training and eight glasses of water a day. It had to be one of the more startling studies the Journal of the American Medical Association had ever published: Nine nursing home residents in their 90s, after eight weeks of weight training involving their legs, nearly doubled their leg strength, added 9% to their muscle mass, and improved tandem (heel-to-toe) gait speed by 48%.